Welcome to the homepage of Grace Baptist Church of Smyrna, Delaware. 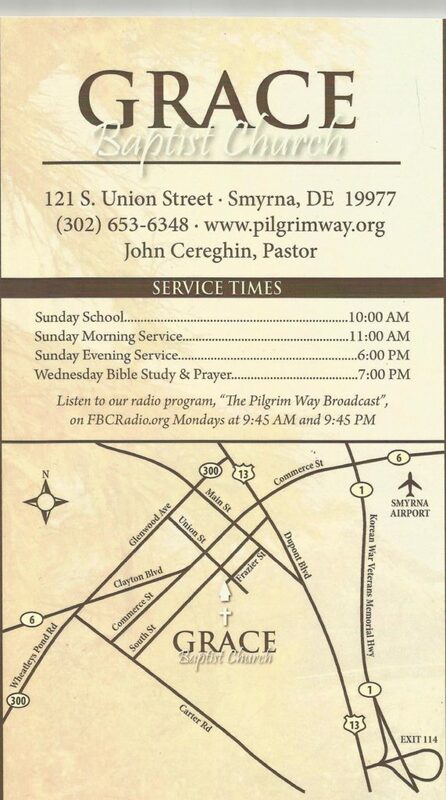 I am Pastor John Cereghin. Our church is located at 121 South Union Street in Smyrna, at the corner of Union and Frazier Streets. Our mailing address is P.O. Box 66, Smyrna DE 19977. We are a small church that supports 16 missionaries in 11 countries. We are the sending church of the Brian Pratt Family in India. If you are looking for a small but friendly church that takes a stand against the contemporary Christianity of our day, that stands firmly on the King James Version of the Bible (as we have since our founding in 1973) and that promotes heart purity and remnant Christianity, then we invite you to contact us. You can email us at gbcsmyrna@gmail.com or jcereghin@gmail.com. You can also leave a message at 302-359-6447 or 302-653-6348. Grace Baptist Church was started in the providence of God in 1973. God allowed us to purchase our current building in 1979, which was built in 1907 and was originally a Methodist church. Pastor Cereghin is the third pastor in Grace’s history, starting his ministry here in 1998 after serving as Academic Dean of Maryland Baptist Bible College of Elkton, Maryland and after having served in pastorates in Centreville, Maryland and Mebane, North Carolina. Grace Baptist’s heritage is ancient, going all the way back to the Apostolic Age. We claim, as part of our spiritual heritage, the grand old groups such as the Donatists, the Albigensians, the Waldensians, the old Swiss and German Anabaptists, the Mennonites and Brethren. Grace Baptist is a part of a “post-Fundamentalist” movement known as “Remnant Christianity”, signifying the numerical smallness and spiritual humility of such churches and Christians. We make no great claims for ourselves and we have no aspirations for worldly greatness. Our only desire is to preach Christ and Him Crucified and to remain faithful to the Scriptures in this corrupt generation. We identify ourselves as a Bible Believing, Remnant Baptist Church, standing on the King James Bible..
You will find at Grace Baptist a small but precious congregation of believers. We sing the old hymns of the faith and the psalms. We preach and teach from the King James Bible. 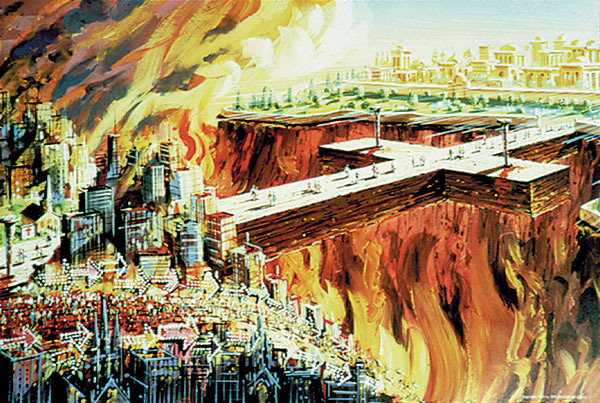 We practice ecclesiastical and personal separation from sin and error. We support missions both here in the United States and worldwide. We emphasize the preaching of the Word of God and prayer above all. We invite you to visit us if you are in the central Delmarva.